a simple, powerful way to reconnect and really TALK with your spouse. Sign up, print, use, and love better. My husband recently asked me if I was happy, happy at home, happy with my pursuits on-line. Happy with my day-to-day. I found the question a little hurtful. I mean, OF COURSE I was happy. How could he wonder about that? Well,okay, maybe it had something to do with the way I am when he calls home…frantic, trying to talk over the screaming, feeling the victim for one reason or another. Or maybe it had something to do with the way I am when he gets home…exhausted, grumpy, unshowered, unkept, too busy for him. Or maybe it had something to do with the things I talk about…how I’m frustrated with the kids, frustrated with him, frustrated with the house, frustrated with the way I look, frustrated with how I don’t have any time to work on the blog, just frustrated. Oh, okay. Yeah, it’s starting to make sense why he would wonder about my happiness. But I am happy. Really. After some hours reflecting and praying about this (and after a particularly beautiful homily this morning) I have come to some conclusions and made some important resolutions. First off, to my pathetic defense, becoming a mom is a big big deal. As a mother EVERYTHING about me has changed–physically I look completely different (even my hair has lost it’s curl), spiritually I feel both closer to God and further away as I have so much less time for prayer, and mentally I feel like my brain has been rewired. It is hard not to focus on what I have lost in this transition–and how much more I am asked to sacrifice as the parent that stays at home–especially when my husband is off on (what seems to be) fabulous business trips to the other end of the globe. And so, when he calls from some (seemingly) fabulous location it is hard to be the charitable wife and mother I really do want to be. And more often than not I fail. I told you my defense would be pathetic. More probably the problem is just that lately I have fallen into an ugly cycle–a cycle we as moms often get trapped in. A cycle where I am the victim. A cycle where I give into cynicism and bitterness and selfishness. I give into these things because it is easier to be cynical and bitter and selfish than to be what I (really truly) want to be—JOYFUL. I want to be joyful because I have so much to be joyful for. Their names are Gus, Bernadette and Dominic. We all have so much to be joyful for, all of us mothers. Joy should be an easy choice, given all of the blessings we have. And yet, it isn’t easy. Whenever we gather, whether in person or on-line, we fall into these same ugly cycles–bashing our husbands, complaining about our kids, one-up-ing each other. Because playing these stupid destructive games is easier than being joyful. And so, even though I know it will be difficult, my resolution (I am making publicly here…because that’s what bloggers do) is to CHOOSE JOY over my own pride, my own hurt and my own wants. I am going to turn off all the destructive inner monologues that have been ruling my life–the monologues that list and recite all the alleged wrongs my husband has done, all the privileges others get that I am denied, all of the things I’d like to do but never find the time to do. I am going to turn off that voice and instead look at the faces of my children, even if they are gross and dripping with snot and contorted with the latest tantrum and I am going to just thank God that they are here, and they are mine. For, there is no greater gift, no greater joy, than being a mother. This truth was struck home particularly hard last week when my husband and I lost our beautiful friend Lindsey. 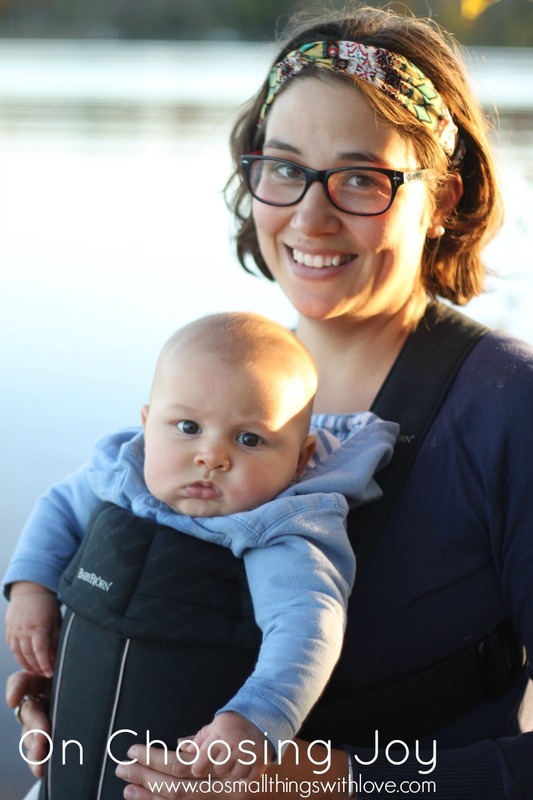 She was my age, married only in October and desperate to start a family of her own–desperate for the joys of motherhood, joys that are my everyday reality. 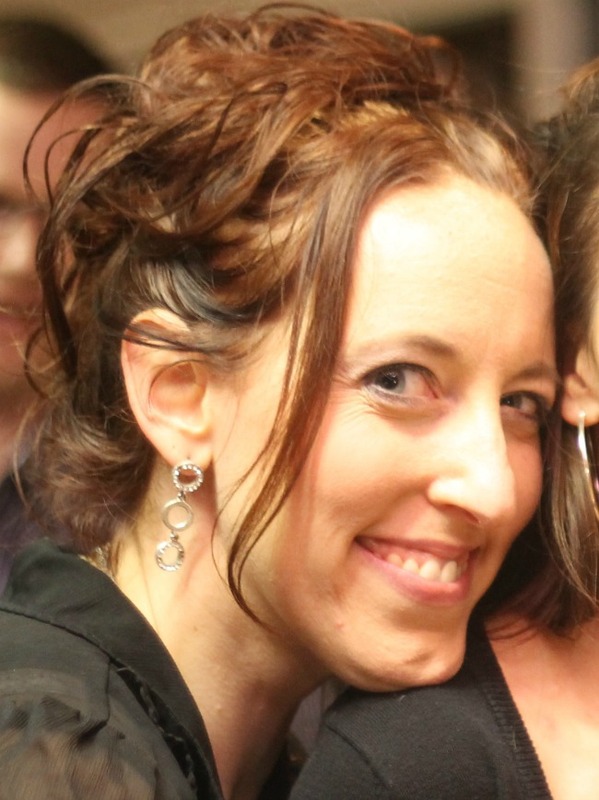 For reasons I will never understand our Lindsey died suddenly last week while on her honeymoon in Mexico. She was so young, so vibrant, so full of life, and just about to start a family, something she had longed to do for as long as I’d known her. Lindsey was beloved not only by us, but by our kids. When she held a baby or swung a toddler in her arms there was so much joy–the joy was palpable. It makes me physically ill when I face the facts that this beautiful woman never got to be a mother. I will never understand why this was God’s plan. Never. I want that joy I saw in my friend every day, every minute I get to spend with my children, even if my husband is gone, even if my own dreams and plans are getting side-tabled. Even then. 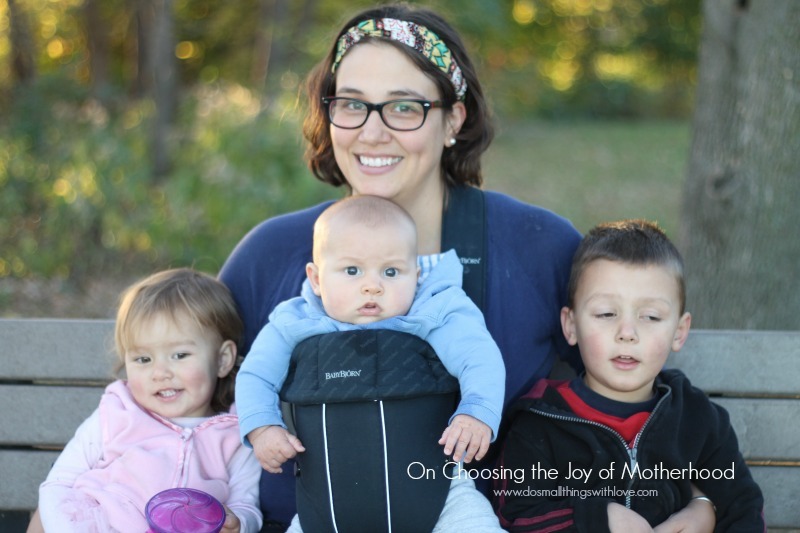 I want my husband, and the whole world, to know how joyful I am in this vocation of motherhood. 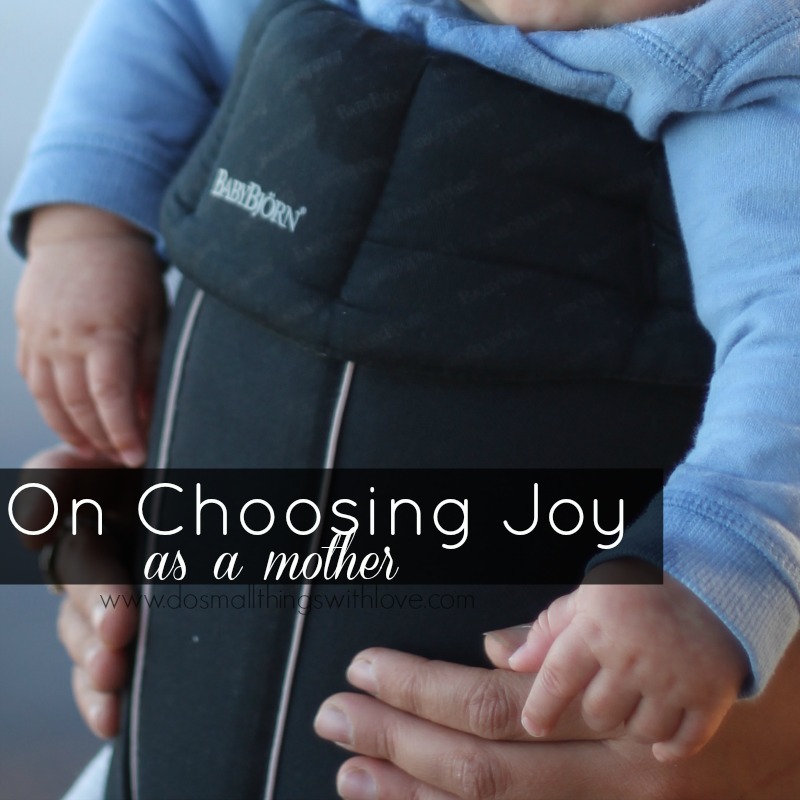 As a testament to my friend, now resting in the lap of Jesus, I am determined to choose joy. This changed the way I look at life, thank you. Thank you for reading. That is a gift. we really are surrounded by blessing, aren’t we?!? Why is it so easy to overlook that! The other day I was discussing with another mom how our bodies have changed so much since being pregnant. A teenage girl sitting in front of us turned around and told us that she was never having kids because all she hears from moms are the bad things. What a slap in the face it was for me. I was so sad that she hasn’t seen the beautiful, miraculous, amazing, nothing-to-be-compared-with side because we are busy complaining about how our ankles are thick. We were able to talk to her for a minute about how wonderful it was…but still, so sad. Thank you for your post. How true it is. And I’m so sorry about your friend, I hope the knowledge that she is with Christ will help. I’ve had similar slaps in the face. It’s a good reminder that all of our complaining really does matter. Thanks for being here and sharing in the struggle! Thank you! A good reminder and very well said- every day is a gift and I can chose to be thankful and joyful with all God has given me. all that God has given all of us! I can relate to the frustrations of motherhood, I also have three young kids under the age of six. Mostly the days go well, but there are certain moments that are beyond overwhelming and I also respond negatively at that moment due to the stress. It is a season, thankfully! I wouldn’t trade being a mom, a stay at home mom, for anything! But I would give for a shower, a well fitted bra, and an extra nap,lol! I’m sorry to hear about your friend. You wrote a beautiful tribute to her. This was so beautifully written, Nancy, and something I so relate too. I am so sorry about the loss of your friend. What a wonderful way to honor her memory though by keeping her in your purpose of a joyful mother. you are so sweet, Kara. Thank you. One of GOD’S greatest gifs to us is the life of a child, as we hold that beautiful perfect baby in our arms for the first time, the feeling is indescribable, so awe struck as you look at that beautiful gift. Motherhood is so rewarding and a gift we don’t deserve. I don’t’ understand why GOD allows some to be mothers and some cant have children, I don’t know why GOD takes some people young and others when there old, we cant know GOD’S plane for us or understand life itself. But I know this, family is very important, watching those children grow is an amazing thing to watch, and watching a couple grow old together is beautiful, I am only 5I and am dying, I wish I did not know that information but I do, I wont get to see my youngest son get married or have children, I wont get to see my oldest son have children, and I wont get to watch my grandchild grow up from my middle son, its hard sitting by my husband every night knowing that some time soon GOD will come to take me home, and its so hard to see all my children and husband and not knowing if they will be all right, we all complain for some reason, but stop and ask yourself, how would you feel if you new you were going to lose one of those family members. I can only say love your children and love your husband but also learn to love the new role you have, learn to be happy and oh so grateful for what GOD has given you, because you never know when he will take it back or you back. GOD bless you and may GOD help you heal and her family. thank you so much for sharing so beautifully–and for sharing such wisdom. I hope your final days are peaceful and full of family and beauty.